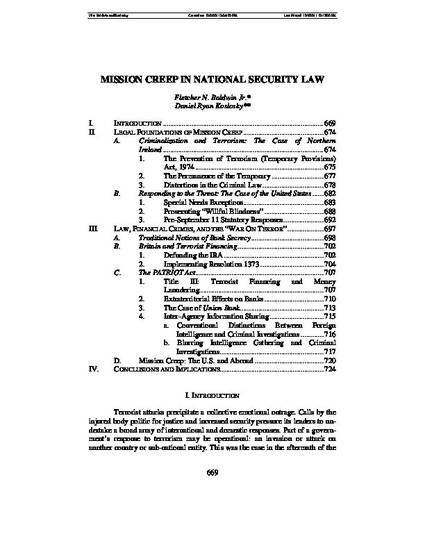 "Mission Creep in National Security Law" by Fletcher N. Baldwin, Jr. Many anti-terrorism measures are enacted with broad public support. There is often a general willingness on the part of the public to accept greater civil liberties deprivations in the face of a specific threat, or otherwise in times of general crisis, than would otherwise be the case. Sweeping anti-terrorism legislation is frequently crafted in reaction to the presence, or perceived presence, of immense, imminent danger. The medium and long-term consequences of the legislation may not fully be comprehended when political leaders and policymakers take swift action in the face strong public pressure in light of a recent terrorist attack or continuing threat of violence. An unintended, and oft unforeseen, consequence of anti-terrorism legislation is that it may alter substantive and procedural law. Various constitutional protections traditionally afforded to criminal defendants, and indeed the general public, may be eroded in the name of national security. Procedural law may also be affected by anti-terrorism legislation leading to substantive consequences that may not have been anticipated by the law’s drafters, and staying on the books long after the immediate threat has passed. This socio-legal phenomenon is “mission creep” — the application of anti-terrorism legislation, its substantive law and procedures, to non-terrorist related offenses and other activities not contemplated in its original enactment. This Article takes a comprehensive approach to analyzing mission creep in anti-terrorism legislation and financial crimes, including its foundations, its forms, and its effects. In order to gain a complete perspective of mission creep, its juridical basis must be explored. Both British and American anti-terrorism measures are examined along with their impacts on other areas of substantive and procedural law. Title III of the PATRIOT Act relating to financial crimes is also presented in conjunction with traditional notions of bank secrecy and financial privacy. Sections of the PATRIOT Act Sections of the Act regarding information sharing between law enforcement agencies, and the elimination of the distinction between intelligence gathering and criminal investigations will also be expounded upon. This Article presents a strong argument for the need of judicial oversight relating to the scope and use of information gathered in national security investigations.